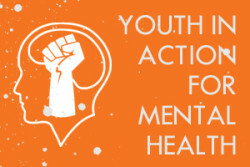 Youth in Action for Mental Health (YAMH) puts youth voices and ideas into action. The program encourages conversations and activities around the promotion of positive and critical understandings of mental wellness and mental illness. Through a peer-based project development model, YAMH starts with the creation of youth leadership teams in participating schools. Through a series of 6 modules, the YAMH team will participate in facilitated workshops and activities to bolster their understandings of mental health, mental illness and wellness. During the fifth module the team will work together to design an Action Plan for a project or campaign related to youth mental health or distress. This project will aim to share their learnings and promote conversations about issues related to mental health. The goal of the project is to promote mental health literacy and de-stigmatize distress to facilitate compassion for others and better mental wellness for young people. YAMH supports mental health education and literacy by opening up a dialogue and enabling youth to define and discuss what is important and relevant to them. This initiative showcases the power of youth to make a difference using a youth-led, adult-supported model of engagement and empowerment. In YAMH, youth are the primary decision makers and carry out the activities they prioritize within their communities. Rather than being passive recipients of information and services, this project empowers youth to be the driving force behind positive mental health education and de-stigmatization.